This entry was posted on December 10, 2014 by Tintean Editorial Team/fdg, in Movie review, News and tagged Irish Communist Party, Ken Loach. Bookmark the permalink. Jimmy’s Hall, Directed by Ken Loach, 2014. 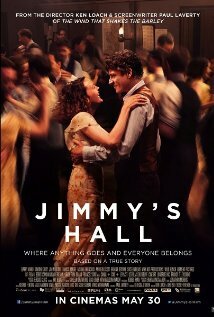 Jimmy’s Hall, from British filmmaker Ken Loach, is the story of James ‘Jimmy’ Gralton, who led the Revolutionary Worker’s Group, a precursor to the Irish Communist Party. Jimmy has just returned from ten years in the United States to help his mother run the family farm. He returns ten years after the Irish Civil War, and a new government is in power, affording a fragile peace in the troubled country. Jimmy is persuaded to reopen the ‘Hall’, a community youth centre of sorts which holds frequent dances and also allows the revered Jimmy to voice his political and social views. This is met with strong resistance from some long-time enemies of Jimmy, notably the church and local land-owners. Chief among his adversaries is Father Sheridan, a pious vulture of the church who believes that Grafton is using the hall as a den of manipulation and seduction, plying young, impressionable minds with Jazz music and Communist propaganda. The themes addressed in the film are aligned and askew at the same time. The hall is named the Pearse-Connolly Hall, in a nod to the ill-fated Easter Rising, its subsequent martyrs and assumed allegiance to the former Republican movement. However, Gralton appears less interested in preaching political ideals and more concerned with the ways in which certain political ideologies will improve the quality of life in his community. Father Sheridan’s motivation and modus operandi appear to be those of fear of the unknown and oppression. The frightening reality of this is displayed in a sermon he delivers which yields horrific consequences for one young parishioner. As can often happen when politics and religion clash, people can end up having two different arguments and mistaking it for one. The film is sadly underwhelming. It fails to connect with the audience in any meaningful way and there are several reasons for this. The script is fairly simplistic, groaning under the weight of clichés and heavy narrative. There is really no way a movie-goer will have trouble understanding the plot: the script goes to great lengths to over-simplify the events of this period of time. The acting is simultaneously over-the-top and forgettable. Ward’s portrayal of the title character is bland and uninspiring. I cared little for his agenda or his struggles, despite the sympathetic vehicle this movie provides for both. He lacks the gravitas and charisma of a Liam Neeson, leaving his performance to taste a bit like a watered down Michael….sorry, Tom Collins. The obligatory love interest (Simone Kirby) seems rather pointless. While she is there to highlight what Gralton leaves behind, the script does not allow the actress to develop any real depth or relevance. The clear standout is Jim Norton as Father Sheridan. His clashes with Gralton bring out the only acting of note from Ward, and his monologues are potent in their antique rhetoric. He is absent for much of the second act, but my strongest memories from this film will surely be Loach’s creation of a man so rigid in his beliefs that it is not simply enough for him to hold them — everyone else must hold them too. Jimmy’s Hall is an average submission from a film-maker who set a very high standard in Irish independent cinema with The Wind That Shakes the Barley. This latest effort feels lazy and uncommitted. It is a perfectly adequate, dramatic representation of events; however, I have come to expect more from Loach. In summation: a pale copy of Michael Collins meets Footloose. Liam writes occasional film reviews for Tinteán.